Just to say thanks to the guys who took part in climbing the 10 peaks in 10 hours to raise funds in memory of Paul Heapy. These donations enabled us to purchase a new Bladder Scanner for the Renal Transplant Ward at Manchester Royal Infirmary. 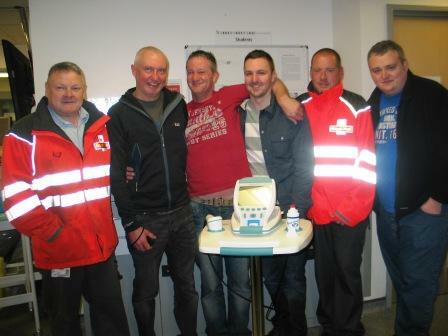 The guys came along to the Ward this Saturday to handover the machine to the Ward. The guys who took part in the challenge were John Sutcliffe, Jimmy Cullen, Steve Barratt, Colin Hulston, Tom Byrne and Pete Culloden, all pictured here. Well done and thanks for your continued support of the Renal Transplant Ward and you can read more about their adventure challenge in the next edition of Whispers.